A bright, white, and healthy smile can improve the appearance and confidence for many people. 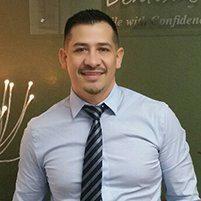 Dr. Zamora improves the appearances of his patients’ teeth and smiles from his practice in the Mission District of San Francisco, CA. You will want to make sure that the dentist has a lot of experience with repairing the dental condition that concerns you as well as a solid track record of performing the appropriate dental procedures. You should research his or her work in advance. The dentist should be able to provide references, and before and after photos of the treatment you want, to show you the results of his work on other patients. Your cosmetic dentist should be willing to answer all of your questions and explain the procedures so that you can understand what will be done to achieve the look you desire. You could also ask about the dentist’s continuing education. While all dentists participate in extensive education before begin to practice, dental techniques and technologies are constantly updated and improved. Check to make sure that your dentist is up to date with current best practices. How Will I Know What Treatment is Best for Me? What will my teeth look like after the treatment?